The I-Spire Series™ Laptop Lift lets you work in comfort by elevating your laptop to a comfortable, easy-to-see level while allowing you to work in a reclined, relaxed position. 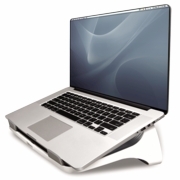 The distinctive laptop riser design helps reduce shoulder and neck strain caused by leaning forward or bending your neck to see your laptop screen or type on the keyboard. The I-Spire Series™ Laptop Lift has a built-in curved design to help improve ventilation under your laptop and keep it cool. The lift also features front tabs to hold your laptop in place so it won't slide around as you type. As part of the I-Spire Series™ collection, the Laptop Lift makes it easy to create a stylish and more comfortable work space at home. Its innovative design and contemporary style enhances comfort and coordinates with other Fellowes® I-Spire Series™ products.